The vision for heating the new Parkstad Limburg Stadion in Kerkrade had been clearly defi ned: an effi cient, high-quality heating system in a cascade solution. The standards had been set high. The system is to cover the energy needs for the pitch heating system, the hot water for all showers and the home team Roda JC’s swimming pool as well as the heat for the offi ces and public lounges (air conditioning and radiators). 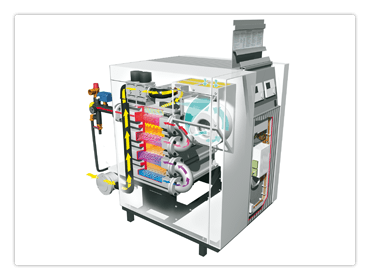 Those responsible for building the stadium chose three RENDAMAX 3605 gas condensing boilers, which provide overall heating power of around 3,300 kW. Another criterion in their decision was the fact that both the installation company Imtech and ELCO are in the area near to the football stadium. Moreover, the two companies had established a good collaboration over the years that could be of benefit.